Box Text: Fueled by revenge for the murder of his true love, the Devil Forgemaster Hector returns to the ruins of Dracula's castle to punish those he once fought alongside, unaware of the sinister plot that has been orchestrated to lure him home. * Explore the biggest 3D Castlevania world yet! 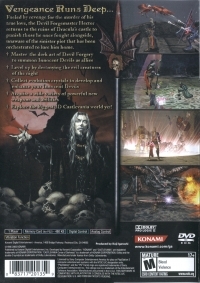 08-20-2018 digi Box Text Fueled by revenge for the murder of his true love, the Devil Forgemaster Hector returns to the ruins of Dracula's castle to punish those he once fought alongside, unaware of the sinister plot that has been orchestrated to lure him home. 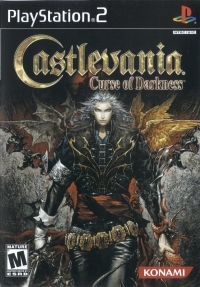 * Master the dark art of Devil Forgery to summon Innocent Devils as allies * Level up by destroying the evil creatures of the night * Collect evolution crystals to develop and enhance your Innocent Devils * Acquire a wide variety of powerful new weapons and abilities * Explore the biggest 3D Castlevania world yet! 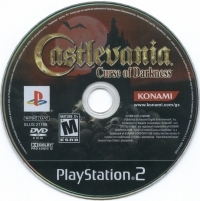 This is a list of VGCollect users who have Castlevania: Curse of Darkness in their Collection. This is a list of VGCollect users who have Castlevania: Curse of Darkness in their Sell List. This is a list of VGCollect users who have Castlevania: Curse of Darkness in their Wish List.